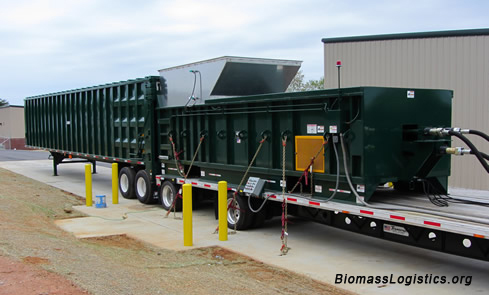 Commercial waste compactor (on right) that has been adapted to hydraulically compact chopped switchgrass into an ejector trailer (on left) for efficient transport at twice the bulk density compared to loose switchgrass. The ejector trailer can quickly self-unload. These are some of the equipment uniquely employed in the project. This website reports on a U.S. Dept. of Energy-funded project that addresses the logistics of harvesting, transporting, storing, and pre-processing ligno-cellulosic feedstock for fuels. We are biosystems engineers tackling the specific problems associated with an annual harvest and supply of biomass, namely switchgrass, from the field to a storage depot for year-round distribution to a biorefinery. Our approach is unique since we have assembled a system based upon a "bulk-format" compared to others that use bales. The project tests equipment and strategies to streamline the feedstock supply process by either dumping or conveying bulk quantities of switchgrass feedstock. A conventional forage harvester is used to uniformly chop the plant to a desired particle size. The chop is quickly hauled from the field to the storage depot, where truck loads are emptied into a pit for reclaim and conveyance into storage bins. The project storage bins serve as a model for large stacks protected with a membrane to shed precipitation. The reclaim auger at the bottom of the bin provides a means to collect performance data that will aid the design of reclaim systems for commercial-scale storage. The 2012 switchgrass harvest campaign was completely monitored with Global Positioning System (GPS) tracking on all harvest and transport equipment. These data provided a basis to determine field capacities, efficiencies, idle times, and insight into improved logistics. Engineering data such as switchgrass moisture content, bulk density, particle size spectra, capacity (ton/h), and pneumatic handling parameters were closely monitored to enable a solid assessment of the logistics system. The chemical quality of the supplied switchgrass was monitored for fuel potential after a range of elapsed storage times. We did not do this project alone! 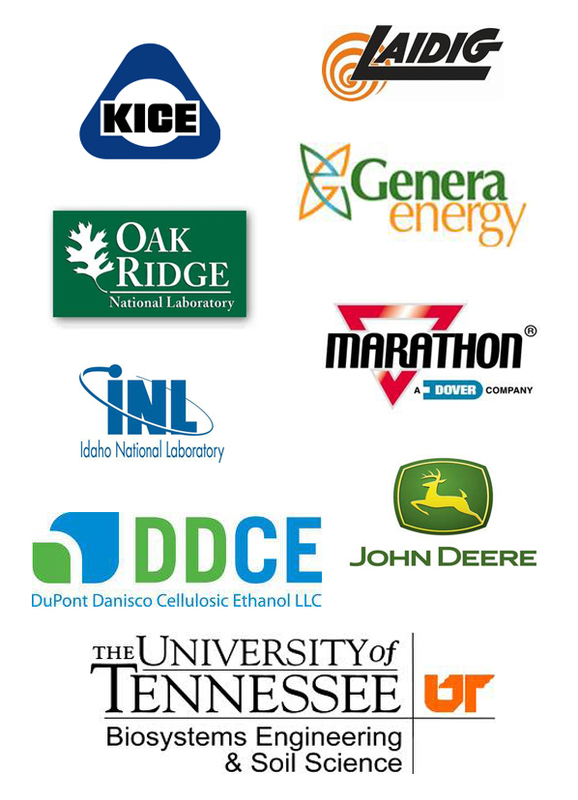 Check out our many project partners. Our partners have excellent capabilities and would be eager to assist others in similar projects! If you have any questions about bulk-format or the experiences with the specific system, feel free to contact Professor Al Womac (awomac@utk.edu, ph: 865-974-7104). Visit our sister website: biomassprocessing.org.